Ready to solve your storage problems right in Johnson, VT? Come rent your storage unit quickly and easily at AG Self Storage. 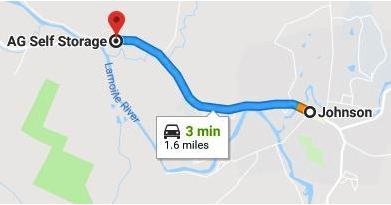 Our facility is located only 3 minutes away from the center of Johnson, at 1015 VT-15 in Johnson, VT (05656) on the southern border of the Long Trail State Forest. Come see why renting a storage unit with us it Safe, Secure, and Simple. Head northwest on VT-15 W/Lower Main St W toward Gould Hill. Continue to follow VT-15 W for 1.6 miles.